Nestled in the southwest corner of the United States, San Diego, California is known for sunshine and salty sea air. With a welcoming hand extended to all visitors, human and animal, San Diego invites locals, visitors and travelers to experience a laid back culture, an outdoor lifestyle and an attitude of ease. Home to all things water related, San Diego shares its love of H2O with all who spend time within her borders. Whether you’re frolicking on the sand with your family, taking in a seaside hike or checking out the many navy ships and aircraft carriers that surround the city, the water is a constant symbol of America’s finest city. Seals are a major attraction in San Diego. Seals in their natural habitat, seals within the care of trainers, seal transportation vehicles that navigate water and land and seals of the human kind who bravely train and risk their own safety for those of others around the world are all set along the shores of San Diego. 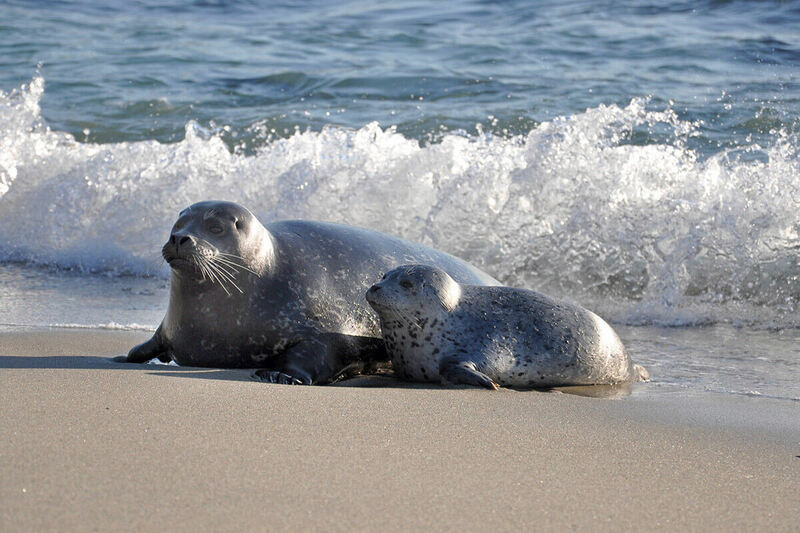 Spend some time away from the fish tacos and breweries and find a way to enhance your stay with a visit to one of San Diego’s seal sightings. One of the most well known attractions in La Jolla is the resident seal and sea lion community. On most days you can find them jumping through the surf, sunning on their favorite rocks or lounging on the sand in the Cove. Regularly hugging the shoreline by the Sea Caves and the Children’s Pool, La Jolla’s sea lion population greets visitors with a friendly nod of the head and wave of the flipper. This free and natural attraction is one of the best things to do in the La Jolla area. No matter the weather, you’ll always start and end your visit with a smile. Whether they’re belly flopping off a rock or making their way to a sunny spot on land, the La Jolla sea lions and their seal friends are ready to say hello to locals and visitors alike. Check the tides, keep an eye on the wave heights and watch your footing as you head out on the walkway to get a good look at our friendly marine wildlife. As you wander along the footpaths of Coast Boulevard, relax on a bench to watch the waves crash, wiggle your feet in the sand or dip your toes in the ocean, the water guardians of La Jolla Cove are ready to greet you. Get your cameras ready to catch the shimmering sunshine bouncing off the ocean, gorgeous sunsets overlooking a multicolored seascape and of course, to catch the seals and sea lions frolicking along with their best friends and family in tow. Check out the Old Town Trolley Day Trip From San Diego To La Jolla if you’re looking for a great way to view the coastline and tour the La Jolla area. San Diego is home to the world-renowned, SeaWorld. Open most days from 10am till 5pm, SeaWorld welcomes visitors with open arms and festive flippers. Accessible by car, bus and trolley, San Diego’s SeaWorld invites ocean and animal lovers year ‘round. The SeaWorld Fun Card provides entrance for one year at a less expensive price than an individual day pass. As one of the three SeaWorld parks in the United States, San Diego’s SeaWorld offers up close and personal access to marine mammals and wildlife. SeaWorld houses both sea lions and seals. Both have infectious energy and exceptional communication. These creatures are equally as social as humans and can’t get enough of their surroundings. At SeaWorld, you can learn the difference between sea lions and seals. Sea lions are the ones you hear first. Often clustered amongst other sea lions, these animals travel and hang in packs. You’ll find them along the shores of beaches, at the edge of piers and hanging on rocks sunning their tummies. Sea lions have long flippers that help them swim and as soon as they jump on land they often pull their hind flippers underneath their bodies and use all four of them to get around easily. As each one of your human friends has his or her own unique character traits, so too do the seals and sea lions. Sea lions have a visible earflap while seals have only holes for ears. Sea lions are often the more vocal of the bunch and are the ones beckoning their visitors with their loud remarks. California sea lions can be found living all along the Pacific Coast of North America. From the Gulf of Mexico all the way to Canada’s British Columbia, you can find these friendly mammals diving in and out of the surf with their friends and family. Surviving on a diverse array of fish, octopus and squid, sea lions and seals thrive amidst the warmer waters and are often happy to see visitors. When they’re all grown up, adult male sea lions can be as large as 8 feet and their female counterparts can grow up to 6.5 feet in length. Learn more about the natural habitat and lifestyles of seals and sea lions at San Diego’s SeaWorld. Known the world over as the elite forces of the US Navy, the SEAL (Sea, air and land) teams are one of the most respected forces globally. Elite, stealth, flexible, strong, fierce, loyal, clandestine, and highly trained are words often used to describe this incredible group. Naval Amphibious Base Coronado is the home of the west coast base of operations for SEAL teams. At any given time there are thousands of military personnel on base and even more students and reservists in residence. SEALS train daily. The first step to become a Navy SEAL is BUD/S training. Basic Underwater Demolition (BUD/S) training begins at Naval Special Warfare Center at Naval Base Coronado-Naval Amphibious Base. If you happen to be walking the public beach at Coronado, there’s always the possibility that you’ll catch a glimpse of SEAL training. As the naval component of the US Special Operations Command headquarters in Tampa, Florida, the US Navy SEALS conduct multiple missions many other entities do not take on. The fierce individuals who make up the US Navy and especially the Navy SEAL teams are exceptional in every way. 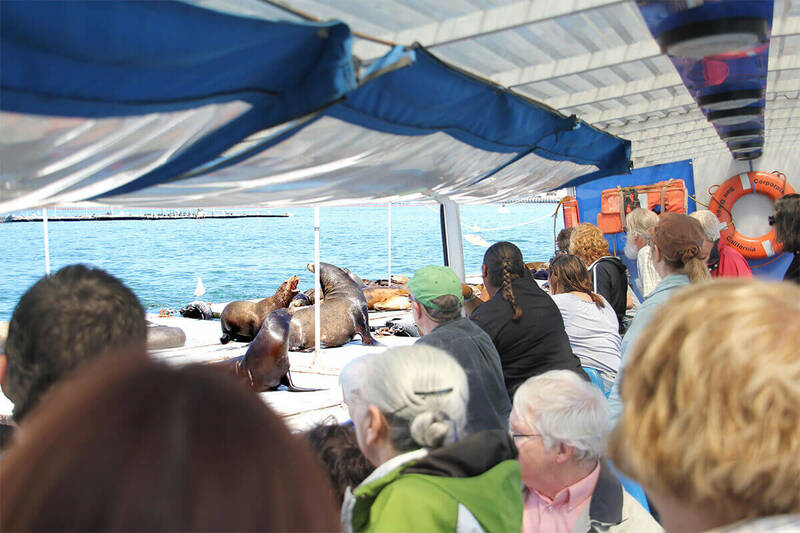 One more way to catch a glimpse is aboard the San Diego SEAL Tour. Hop aboard the amphibious vessels designed specifically to navigate both land and sea. On this special voyage, visitors will get a bird’s-eye view of both San Diego streets and seascape. Departing from both Seaport Village and the Embarcadero, this one-of-a-kind vehicle will cruise the streets and waterways of America’s finest city. After meeting the captain, you’ll head off on a remarkable voyage through San Diego’s journey to today. While navigating the roads and waves, your captain will share with you San Diego’s military history, take you on a visit to see some of San Diego’s sea lions, show you the city skyline, fill you in on some of the city’s beginning joined through work and friendship of immigrants and even show you the space where the Spirit of St. Louis first came to life. Our SEAL tour gets its name from both the sea and the land. Focusing its sights on San Diego, this amphibious vehicle is in its rightful home. Surrounded by sea lions and protected by SEALS of the humankind, San Diego invites visitors to experience a city set in sunshine, with a shared love of cultural diversity, military friendship and love of the sea.